The Endocannabinoid System is often referred to as the link between body and mind. Endocannabinoids are lipid-based neurotransmitters that bind to cannabinoid receptors on nerve synapses in the mammalian brain and the central and peripheral nervous systems. The Endocannabinoid System is responsible for regulating the physiological and cognitive processes such as appetite, pain sensation, mood, and memory, which allows the body to achieve a homeostatic state. Phytocannabinoids are compounds that are found in hemp plants. These cannabinoids trigger the Endocannabinoid System in the body. Cannabidiol, or CBD, is just one of the 113 phytocannabinoids found in hemp. Unlike some of our competitors, Alive Market utilizes all of the phytocannabinoids found in the plant, making it a full spectrum product. The two primary Endocannabinoid receptors have been identified as CB1 and CB2. These receptors are found predominantly in the brain and immune system. Cannabidiol (CBD) is one of the 113 phytocannabinoid found in hemp plants that binds to these pathways to trigger an immune response and/or stimulate nervous system activity. Furthermore, CBD is non-psychoactive; it provides all of the health benefits and none of the intoxicating effects! Terpenes are fragrant oils that give hemp its aromatic diversity and bind to receptors in the brain to provide various mind and body reliefs. 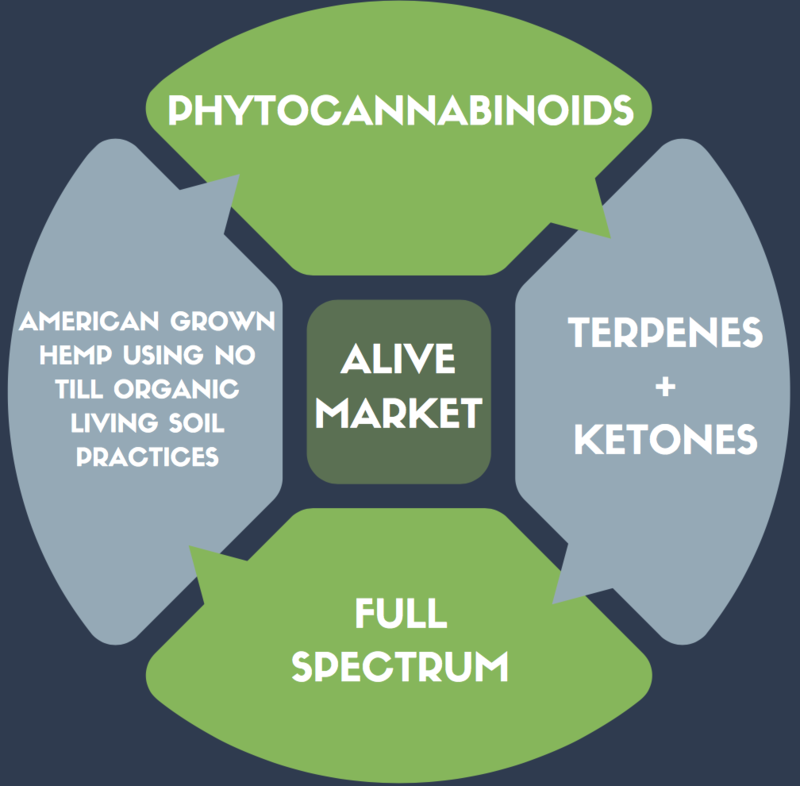 Alive Market sells Full Spectrum products, in which all of the cannabinoids and terpenes work together in what is called the "Entourage Effect." This magnifies the therapeutic benefits of each of the components of the plant. In other words, the whole is greater than the sum of its parts. Alive Market uses FULL SPECTRUM CBD, or whole plant CBD, which contains every Cannabinoid found in the hemp plant. This provides a large variety of naturally occurring VITAMINS and MINERALS such as Vitamin A, C, E and as well as Complex B Vitamins like Riboflavin, Thiamine, and Niacin (vital for a healthy immune system, Nervous System, and Brain Development). Alive Market's full spectrum hemp CBD products start with organic, NON-GMO, pesticide free, high CBD raw hemp flowers. It's then processed into distillate oil and mixed with organic, Non-GMO MCT Coconut Oil.